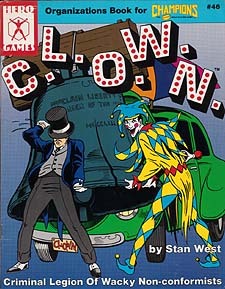 Enter the wacky and wild world of C.L.O.W.N., a group of supers who commit crimes for the fun of it! Match wits with Slapstick and Merry Andrew. Race against TEE-HEE, a car with a mind of its own. And when CLOWN begins the world's largest scavenger hunt, can you prevent the mayhem from getting completely out of hand?